For example, Kaaya CEO Harsha Kikkeri showed me a video animation of someone in a submarine launching torpedoes at an unseen enemy. Going from dancing robots to literal war was quite an escalation, but it illustrated the varied spectrum of possible use cases. It's not easy to train inside submarines, but the HoloSuit could be a way to simulate that environment, training people as if they were helming a sub beneath the depths. It may find a use for manual labor jobs to alert employees when they're putting themselves in physical danger - or maybe for controlling robots sent into burning buildings. There are a lot of possibilities, including plenty of applications in VR and AR. Immediately I thought about using this as a full-body virtual reality controller. Harsha Kikkeri knows a thing or two about robots: he was a robotics software engineer for Microsoft for several years. Now he's applying that expertise to humans, and the results are promising. 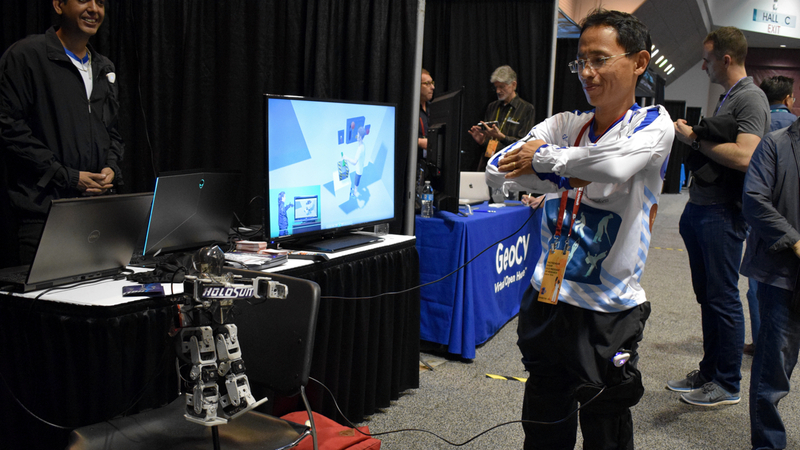 The HoloSuit seemed very precise in my demo, even though I was only using the jacket part. Kikkeri then put on his own jacket showed me a computer character on the screen tracking his movements with even more exactness than the robot did.